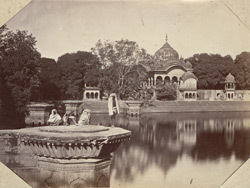 Photograph of the Temple of Kusum Sarovar at Gobardhan in Rajasthan, taken by William Henry Baker in the 1860s, from the Edward Molyneux Collection. The image is inscribed in pencil on the reverse: '209 [corrected to] 219. The Kishin Sorabah Temple & Tank (Goverdhun).' This is an albumen print, signed 'W. Baker 219' in the negative and the number and caption correspond to the entry in the Baker and Burke catalogue published in Lahore in 1872. This view across the Kusum Sarovar Tank shows the memorial chhatri built in memory of Maharaja Suraj Mal soon after he died in 1763. It is one of four such shrines erected to the Maharajas of Bharatpur; the capital of the Jat state.